One of the most popular music instruments used by a lot of musicians and even normal people is the guitar. This is precise because it is very easy to learn how to play one. With just the right amount of patience and dedication, one could learn how to play the guitar in a short span of time. If you are into music and guitar is your musical instrument, you might be wondering how to hang a guitar on the wall, just like how music stores do it. If you want to know the tricks that other people do in hanging a guitar on the wall and other valuable information regarding safe guitar keeping, then this article is for you. Read on! Before we tell you the steps on how to hang a guitar on the wall, we will throw you this mind-boggling question: Why do music stores and musicians hang their guitar on the wall? What are the benefits of doing so? If you have the same issues, we might have the answers written below. One of the best benefits a hanged guitar has is that it could easily be accessed. For instance, when you are feeling lonely or tired about your life and you think that playing the guitar would make you feel better, you don’t want to go to the attic where your mom stored it and fight against cobwebs and other mess just for you to get access to your guitar. By simply hanging your guitar on a wall, you will not a rough time to get it and thus, it could save you from doing some other things rather than playing the guitar while feeling lonely and sad. With just a few steps, you will be able to reach it and play it anytime of the day. Most guitar players say that a guitar hanged on a wall is easier to access rather than putting it inside the case or from a guitar stand. Well, there is no scientific research whatsoever with this particular contention especially that getting a guitar from a case doesn’t take a long time and hard work, there is something psychological about guitars hanging on the wall. This is pretty related to the next benefit written below. An image of a guitar hanged on the wall is more enticing rather than a guitar that is made invisible especially when it’s put inside a case. Meaning, hanging a guitar on a wall could be a perfect everyday reminder that your guitar isn’t just hanged there for some reason but rather, it is for you to pick it up and play it. You don’t want to just hang a guitar and leave it there as a wall design. You’d rather play or enjoy something which you can constantly see rather than something that is being hidden inside a case, right? 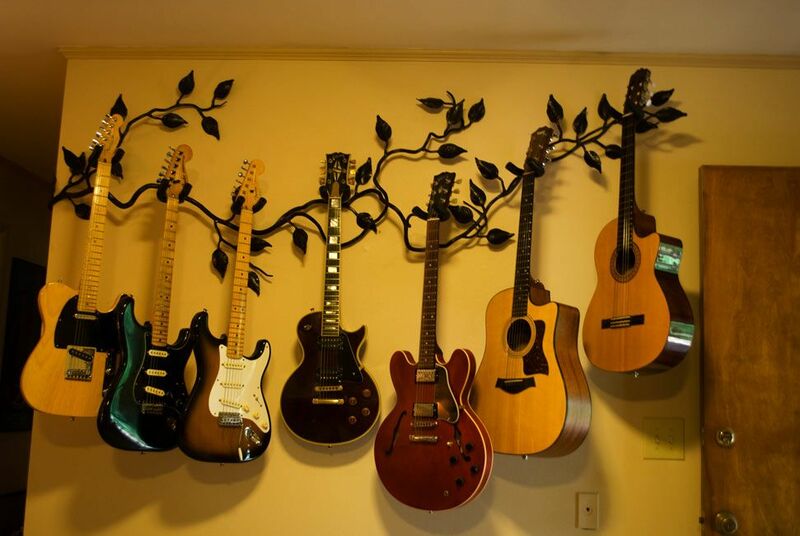 One reason why hanging your guitar on a wall is the best option you could make is that it saves up space. This is especially true when you are living in a small place like a room, a small apartment or a condo unit. Guitar stand is good but when you need to save up space for other more important things to occupy, hanging your guitar on the wall might be your best option. Now that you know that hanging a guitar could be very beneficial, here are some things you need to know how to properly hang your guitar on a wall. Take note that one little mistake could spell a great difference in the hanging process, especially if your guitar is quite heavy. This is why you need to pay attention to these details. In this step, you need to do the necessary cuttings of the materials to be able to assemble them later on. First, you need to remove the screw from the bed leg with the use of a small pipe wrench or even a plier. Next thing to do is to reverse the anchor screw and install again the threaded end into the bed leg that leaves out the “wood screw” out in the open. This is to ensure that the connection to the wall is more secured. Once done with the preceding process, the next thing to do is to remove the cap or tack of the bed leg. Then, drill a hole to this small enough to accommodate the wood screw as well as the garden tool hanger. Assemble the garden tool hanger into the semi-drilled hole. And then, with the use of the stud finder, look for the stud in the wall where you want to install your guitar. The next thing to do is to drill another hole but this time into the stud to accommodate the wood screw that serves as the end of the guitar hanger. Then, after the previous step, you now have to put the guitar hanger into the drilled hole deep enough that it won’t wobble when you hang something in it. Lastly, and most enjoyable, hang your guitar on the guitar hanger. Make sure that your hanger is securely placed to avoid destruction of your guitar from falling. If you don’t want to go into trouble of looking for the materials mentioned in the previous guide, you can just buy Studio Guitar Hanger on stores or online stores. These guitar hangers have exclusive tubing that doesn’t mart your instrument’s finish. It is durable because of its hardwood construction. Its yoke holds to any type of headstock and is adjustable to any width. So if your instrument is narrow or wide, you won’t have any problem. Step 1. Choose a location. Step 2. Using a Philips screwdriver, drive screws through the hanger’s mounting holes into the wall. Step 3. If there’s no wall stud, use the pilot holes to install the plastic toggles. Use screwdriver to turn and push the toggle clockwise. Step 4. Mount the hanger. See, it’s easy as that! 1. Will the Guitar be Damaged from Hanging? The best answer to this question is yes. It might even destroy your guitar, especially, when you don’t do it properly. This is precisely the reason why when you choose to hang your guitar on a wall; you have to do it right or else you will have to suffer the consequences. 2. What About Guitars Hanged on Stores? Since guitars in stores are sold and bought all the time, there is no difference when it is hanged or not especially when what you are worried about is the quality of the guitar. Hanging it on a wall will not damage or destroy it whatsoever, especially stores that sell them because sellers often take care of these guitars because these are the very products they sell and make a living out of. If you want to be more creative in guitar hanging there are ways you can do it. So, here are some of the products you can buy to optimize your guitar hanging experience. If you think that the simple 3-foot guitar stand you bought before is stylish, then think twice because there are un-boring guitar stands you can purchase. If you want a solid wood stand, you can buy one for your Taylor 310 series. However, if you don’t prefer generic wood stand, you can purchase Cooper Stand Pro. You can conveniently fold it away if you want to store. It also has this professional look if you want for one. If you want to have a stylish and expensive display stand, you ca go with Fender-made hanging display stand. If you’re not familiar with it, I’m expecting that you will be wowed if you will see it. Whatever bass or guitar you have, you can still this guitar stand. It’s also properly padded so your guitar will be padded from scratches and dings. 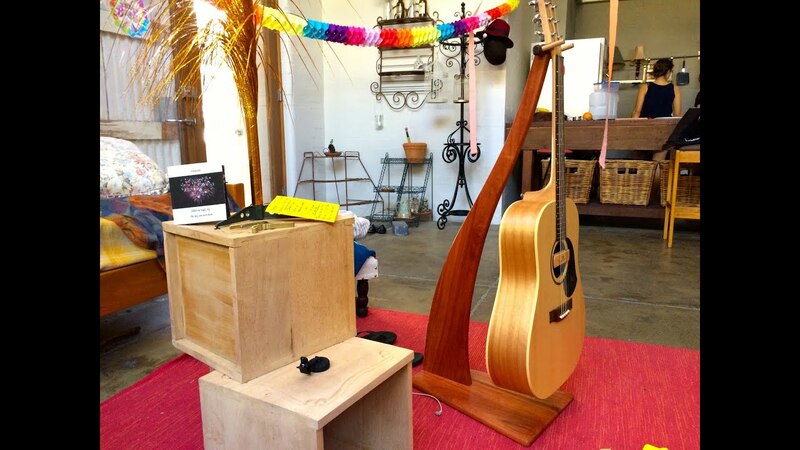 It is a very elegant way for guitar display. There are guitar wall hangers you can choose from if you don’t prefer the guitar stand for display. The first one you can choose is a gravity-activated headlock and ingeniously designed hanger that looks cool. It also doesn’t fall off even if someone accidentally bumps into it. You can also check out the grip hanger that hangs the guitar. If you are a heavy-metal guitarist, it will suit you. You can also hang your guitar vertically, yes it’s possible. Using a vertical guitar hanger will give your guitar the horizontal tilt. If you are hesitant with hanging a guitar, nothing will ever beat your curiosity rather than trying it yourself. It could be fun and easy, and it will never damage your guitar especially when you do it properly. Have some suggestions, comments or reactions? Write them down below and we’ll see what we can do about it. We hope that you had fun reading this! Happy hanging!